It started with an anonymous leaflet circulated around campus, calling for frustrated students to meet on the Quad on Wednesday night, October 3, 1984. By the next morning, Illinois State University would become national news. Because what started as a small protest over new city laws restricting giant parties and drinking swelled into an angry, destructive mob. Hundreds of students marched from campus to Downtown Normal, throwing rocks, slashing tires, and facing off with a growing police force that used tear gas and riot gear to push back. That night became known as the “beer riot,” and it’s still one of Illinois State’s most embarrassing episodes. It’s been 30 years since then, but it feels more like 300 given today’s thriving town-gown relationship between the University and its home. 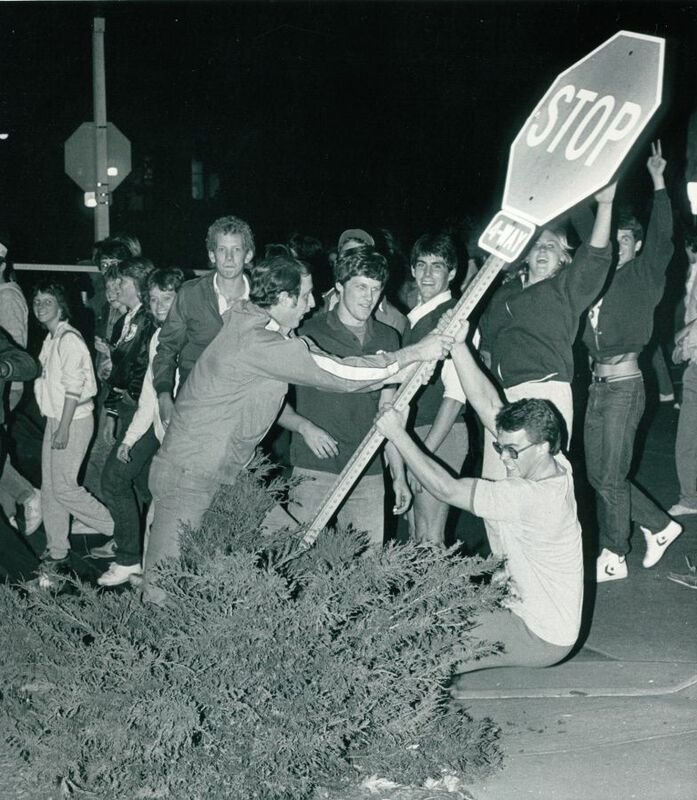 Here’s a look back at what led to the beer riot and how deteriorating town-gown relations finally fractured, and then were healed, in the words of those who were there. Various efforts to improve town-gown relations came up short, including Party Patrol, a unique student-police partnership. 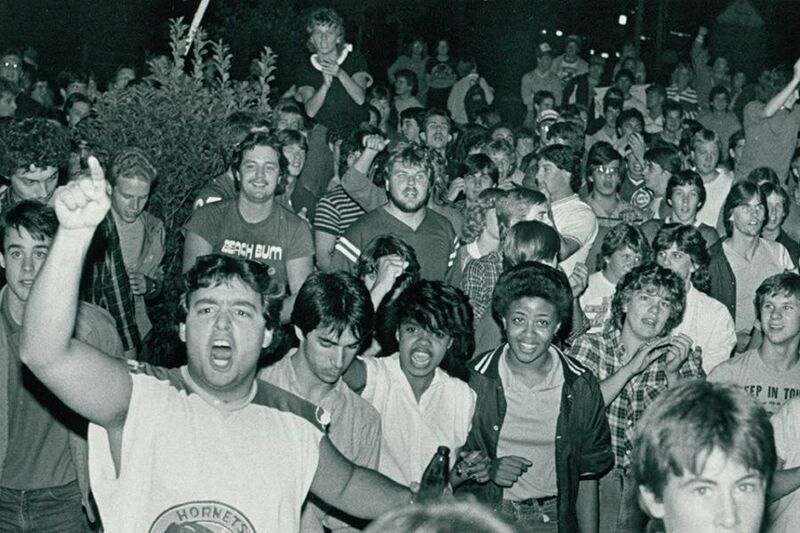 Reacting to years of complaints by neighbors, a divided Normal City Council voted in July 1984—while students were on summer break—to enact new ordinances restricting mass gatherings and the sale of beer kegs. The seeds of the large off-campus beer parties in 1984 were planted 60 miles away when the state legislature in Springfield increased the legal drinking age for beer from 19 to 21. At the time, I protested the age change to 21 in communications to legislators because of my concern it would lead to drinking in uncontrolled situations. And that is exactly what happened. There were parties that were out of control, and the town needed to act. There were parties in parking lots with thousands of people. There was no accountability. One of the problems in Normal was that developers were … putting these large student housing off-campus apartments next door to single-family houses. A lot of campuses throughout the U.S. have a buffer zone between the residents and the students. In Normal, you didn’t have that. Keep in mind: Up until the mid-1970s, the town of Normal was dry. You had to go to Bloomington to get a drink. There hadn’t been a lot of history with this in the community. Arney: Passing those ordinances during the summer when the students were away, that seemed really underhanded to us. So students come back, and their lifestyle, their way of blowing off steam on the weekend, has been altered. A reaction of some kind was coming. Godfrey: Throughout, there was a town council-university liaison committee with student membership to ensure student input on the issue. Student leaders opposed the keg ordinance before the council. At all times, students were given the opportunity to address the council. Communications were fully open. (The keg ordinance) was the last straw. It felt like the town of Normal resented ISU students being here, even though when we were in town, we were the majority of the population. The timing (of the ordinances) was terrible. We shouldn’t have done it then. We just wanted to be in position for when students came back to campus, to have all this stuff in place. 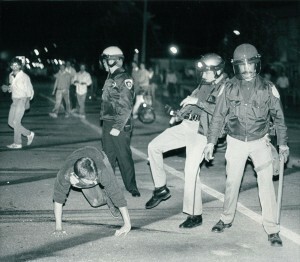 Party and alcohol-related arrests spiked 300 percent in Normal during the fall 1984 semester. In a glimpse of what was to come, hundreds of students destructively celebrated the Cubs’ National League East title Monday, September 24, 1984. Charnogorsky: The Cubs deal was nothing. That was just Chicago-based kids running around campus. We ended up running to the football field and tearing down the goal posts, taking the posts onto the Quad, and depositing them on the Quad. That was the extent of that. At least five people were arrested in the days after, with more facing university discipline. There was discussion about whether the eventual beer riot ever would’ve happened if they hadn’t had the practice round with the Cubs—and knew they could get away with it. Arney: The Cubs also played a playoff game on October 3, 1984. I think that was a factor because people had been drinking and watching the game. And drinking and political activism just don’t go well together. Charnogorsky: They decided to put together a protest on the Quad. Somebody got the idea to go by the dorms to rally the masses. And that’s what happened. It swelled quickly. I said to myself, ‘This is cool. They’re having a riot over beer. I love college already.’ Being one not to miss a party, I went over there by myself and picked them up on the south side of Watterson. Charnogorsky: They then went over to the intersection right by Hancock Stadium, and someone bought a keg of beer, sat down and put together an impromptu party. Normal’s police chief, David Lehr, attempted to diffuse it by sitting down and having a beer with these guys. Schermer: I was in my Bone Student Center office, and all of a sudden there’s this commotion going on. So I walked outside, and in the center of Main Street and College is this huge mob of people and police cars. And here’s the police chief in the middle of this, drinking beer out of the keg. I saw it myself. That was one of the unwise moves authorities did at this event, thinking that would calm things down. That only got them more excited. Arney: We made a big deal out of that in the Vidette. And we shouldn’t have. (The police chief) was just trying to calm the crowd. And then the crowd made its way downtown to City Hall. Hancock: I was just as ticked off as they were about the way the City Council went about passing these ordinances. But I personally thought this response was bizarre and stupid and silly. Arney: Students were tearing down stop signs, phone booths—we had phone booths back then. I have a very vivid memory of this guy I saw around at parties … he was grabbing big chunks of rock and just whipping them at the windows of Normal City Hall. And I’m thinking, what are you doing? But then some of the people from the rally were picking up the broken glass with their bare hands and putting it into trash receptacles. Hancock: I saw the state police come off their buses in their riot gear. It was kind of scary. There were images of Kent State coming into my head. Godfrey: Police acted with remarkable restraint, even though they had to dodge some thrown items. At City Hall, state police lobbed tear gas at a group approaching their squad cars, but the wind blew the fumes back away from the crowd. Charnogorsky: I was standing behind the skirmish line, and there was no coordination between the local police and the other law enforcement called in to help. Somebody on the roof of City Hall decided to launch some tear gas canisters into the crowd. The students then chucked the tear gas canisters into the skirmish line. Arney: The main police strategy was to get them out of Downtown Normal. And they did so very successfully by just basically bum-rushing the crowd and stampeding down North Street back onto campus. The riot lasted into the morning. At least five people were arrested in the days after, with more facing university discipline. Five suffered minor injuries. The Vidette would fight (and lose) a legal battle over allowing authorities to review its photos as part of the investigation. Watch video of local news reports of the incident. Randall: My most vivid memory was waking up the next day, listening to the Chicago radio stations, hearing stories about the riots the night before in Normal, Illinois. Charnogorsky: I was getting lots of phone calls from news media. It was a pretty wild time. I learned a lot about life in a short amount of time. Kambic: I remember my mom calling me and freaking out because she’s up there in Chicago, I’m down here my first semester away, and the news stations are showing this riot about beer. Godfrey: Damage to the downtown was limited to some broken windows, a destroyed phone booth, and trashed areas. I ordered town crews out at 5 a.m. to clean the downtown so when people arrived for class or work in the morning, there was little evidence of what happened. Arney: Afterward, we were all fairly embarrassed. I mean, wrecking up the town over a beer law, for our right to drink illegally, that’s not a cause that’s gonna get you a lot of national sympathy. Randall: We geared up for a repeat incident the next night. It never came. Godfrey: As far as ISU’s reputation was concerned, there was no lasting impact. It was basically a one-day story in most media. Schermer: The students quieted down. They just needed to have their opinions expressed. Arney: These obnoxiously large parties went away. They never were much fun. Parties became smaller, more intimate, and better. And so that’s one outcome—the parties got better. Charnogorsky: Tensions were running high, and police pulled back. The means didn’t justify the ends, but it did send a message. Thirty years later, town-gown relations are arguably better than ever. Notable examples include the recent installation of Redbird street signs in and around campus, as well as student volunteer efforts in the community, such as Bring It Back to Normal. Godfrey: Everyone involved realized it was necessary to work even harder in communication and cooperation. After I became mayor, we created a student liaison committee, with three members from the council and three student leaders. That gave students a direct forum with council members to discuss issues. One of the things I hoped to accomplish while I was mayor was not to have a beer riot. As I recall, we did not. Anderson: I learned a lot after that incident, just trying to open up lines of communication. It was right after that we started preparing and delivering to the Student Senate an agenda for the next City Council meeting. Things have been really good in recent years. I’ve been in Normal since the early 1980s, and I’ve seen significant improvements in town-gown relationships, and a reduction in those frictions of the ’80s and ’90s. Harmon: We changed some of the zoning (in Normal) so that student apartments would not go into some of the residential areas where they could’ve gone before. Koos: That helps solve the town-gown friction issues that we had, but equally important, it gave students a place close to campus where they didn’t have to get in their car to drive to class. Harmon: And the University stopped expanding. Enrollment around this time was frozen at around 20,000. The stabilization of the borders of the University, and the stabilization of the borders of where the students were living, those were all things that over time would help the situation by having everybody adjust to a more permanent border around the campus. Anderson: It wasn’t any one thing. It was a combination of things. People in the town changed. People in the University changed. Relationships developed and grew. Koos: I was lucky enough that Al Bowman was president of ISU when I was mayor. As owner of Vitesse Cycle Shop, I sold Al his first bike when he moved to town. I’d known Al since he came here as a brand-new faculty member. We’d already had a good relationship, and we were able to deal with any issues and, frankly, there weren’t many. Schermer: The Dean of Students and University Program Board have done a great job with late-night programming, like late movies on a Friday night, giving students something to do other than wandering around town and getting into trouble. There were little things that happened that took the edge off, like leaving the Bowling and Billiards Center open past 10 p.m. on the weekends. Godfrey: Normal was founded because of the University, and they have grown and prospered together to form what I consider to be the finest university community in the nation. Harmon: I’ve always felt ISU is the No. 1 asset to the community. I had returned to ISU in the fall of '84 at 29 years of age to get my 2nd degree living in an apartment on Willow Street the 1st semester. I remember the angst among students over the "keg ordinance" passed that summer, and the cops were hell bent in enforcement. I even received a ticket for having a can of beer on the sidewalk in front of our apartment building one night which I thought was ridiculous. I was NOT a rioter, but the night that happened I recall going downtown after hearing about it and seeing students faced off against police in riot gear in an ugly confrontation. From the periphery, my roomies and I observed this group then move to a more open area which I recall being closer to what was the Normal governmental building and/or police department. This was when we saw tear gas being dispensed. I was not near enough to get any of the effects. Relating the Cubs being in the play-offs when that happened and failing is also a memory I have from those by gone days at ISU. I was a Sophomore living in Fell Hall, my room facing the Quad when we heard crowd noises. We all started hanging out our windows watching the crowds and all of the sudden the goal posts started to pass the building! Crazy! I remember we all started yelling in excitement. I remember watching the Cubs take a 2-0 lead on the Padres in the playoffs and a World Series appearance was 1 win away, the buzz was in the air. My roommates and I saw the flyer for the rally on the quad and thought we would check it out, so I brought my camera along. We joined in the middle of the rally and I was taking photos, then it took a turn(to Redbird Liquors and a keg) headed towards 51 and College. Next thing you know the intersection is shut down and Police Chief Lear is there trying to came the situation, he is handed a beer and I get my photo of him with the beer in the middle of the intersection. The crowd moved on towards the Police Station and that's when things started getting out of hand. We decided to call it a night before the tear gas came out. I printed up the photo and got the shot of Lear and the beer in the Pantagraph and Vidette. What most people don't remember was that the town of Normal had a group of police officers dedicated to breaking up student parties. About 2 or 3 weeks prior to the "riot" there was a picture of these officers in the Vidette wearing tee-shirts that read, "Fun-Busters". The shirts had a picture of a beer keg with a diagonal line through it (this was a take-off on the then-popular ghost-busters logo). As I recall, the tee-shirts had been "awarded" to the officers by Normal's police chief, David Lehr. This picture and the accompanying article was fuel added to the fire as it made it appear the police loved breaking up these parties. I was there that night, I remember it well. It started out as a peaceful protest joined but a large group of hooligans. What spoiled children we were then.